There are several choices in shopping cart covers. How do you find the right one for you? It really depends on the features that are most important to you. 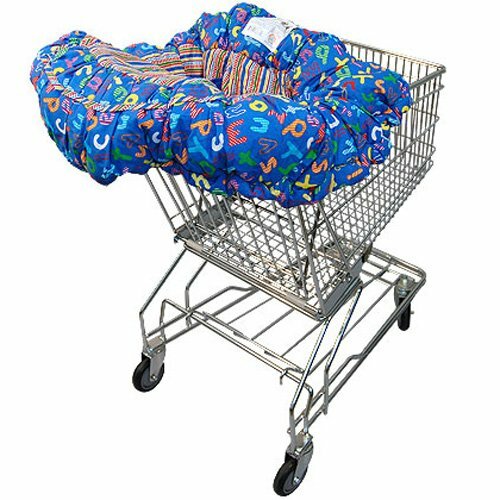 If you are looking for a safe, comfortable cover that fits on all shopping carts, you will probably love the Floppy Seat Shopping Cart and High Chair Cover. Some shopping cart covers only have padding on the front and back, leaving the sides of the cart accessible to the baby. This floppy cover completely covers all four sides of the cart, keeping your child away from germs. Also, the padding is very cushy so you don’t have to worry about your child getting hurt if they accidentally throw their head back. Your baby will be safe and comfortable. Are you worried about finding a cart cover that will fit over the large carts at stores like Costco? Because there is elastic all along the edges of this cover, it can stretch easily to snugly fit on any size shopping cart. This shopping cart cover includes several toy loops so your child can have all her favorites within reach. It also includes an inside pocket that is the perfect size for a bottle and personal items. The Floppy Seat is designed to also fit perfectly on restaurant high chairs. The elastic keeps it secure and the padding helps keep your child in place. This cover can also help keep food off the restaurant floor. Just pick up your child with the cover still around him to carry him outside where you can shake it out. If you are looking for a compact cart cover, you may want to try a different brand. The Floppy Seat Cart Cover is large and has lots of padding. To many moms, the size of the cover is not really a problem. In fact, they appreciate knowing that the padding gives their children the benefits of comfort and extra safety. The Floppy Seat Shopping Cart and High Chair Cover is an excellent option for moms who want to keep their child comfortable in a variety of different size shopping carts. It is also handy if you are looking for a cover that can also be used easily on restaurant hair chairs.